Description: This shows the coal train helpers and another set of helpers that showed up light. Description: Two sets of helpers on an eastbound at CP MO. Description: This helper set heads east towards CP Rade. Description: 4 unit power move east of SD40-2's. 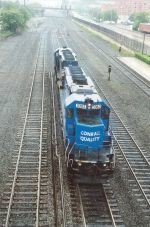 Description: NS 3363 still in Conrail blue helps an eastbound freight thru Cresson, PA. Description: Helpers shove tonnage east through Lilly. Description: A pair of helpers returning to Altoona on track two. Description: We return back to the curve where this helper sets passes through the beautiful light on the east side of the curve. Description: Rear helpers shove an eastbound freight on track 1 through CP MO. Description: NS 3363 (ex-CR 6417) passes a group of railfans on the observation deck. Cresson, PA has a very nice observation deck to watch trains. Description: 13G departs Altoona with both head end and rear helpers. Description: Photo of SD40-2s 3392 & 3363 as all three units smoke it up.